Former House Speaker Paul Ryan has joined the board of the slimmed-down Fox Corp. as it completes the sale of the bulk of its entertainment assets to Walt Disney Co. In announcing the appointment, Fox lauded Ryan for his role in spearheading "efforts to revise the tax code, rebuild national defense, expand domestic energy production, combat the opioid crisis and reform the criminal justice system." 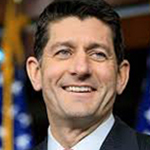 Prior to his election as Speaker, Ryan chaired the House Ways and Means Committee and Budget Committee. He was VP candidate for Mitt Romney's presidential run. Chase Carey, CEO of Formula 1, is joining Ryan on the Fox board. He's the former vice chairman and president & CEO of 21st Century Fox. Rupert Murdoch's son Lachlan is chairman/CEO of Fox. The broadcaster began its life today as a standalone company, trading on the NASDAQ. Share price is currently at $39.65.